Product prices and availability are accurate as of 2019-04-22 22:52:30 EDT and are subject to change. Any price and availability information displayed on http://www.amazon.com/ at the time of purchase will apply to the purchase of this product. 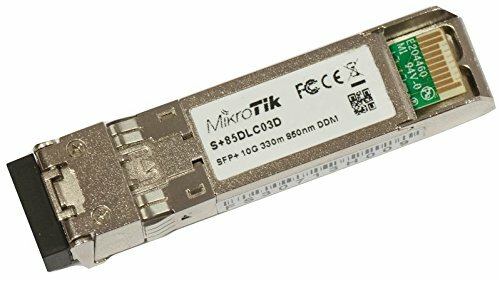 S+85DLC03D is a 10G SFP+ transceiver with a LC connector, 850nm, for up to 300 meter Multi Mode fiber connections SFP+ module 10G MM 300m 850nm LC-connector DDMI Data Rate 10G Format SFP+ Distance 300m / Mode MM Connector LC Units are tested and compatible with CCR1036-8G-2S+ and CCR1036-8G-2S+EM. 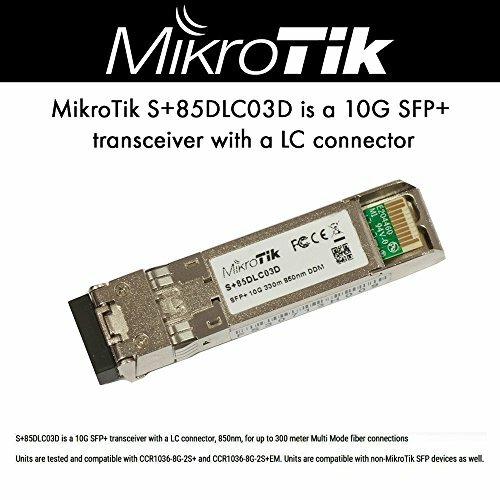 Units are compatible with non-MikroTik SFP devices as well.